Prime Minister Narendra Modi said on Sunday it was now time that India ended its dependence on imported weaponry and become self-sufficient as it did in respect of food grains. “Indian armed forces are second to none, and now the time has come to ensure that the weapons and equipment they carried and used are also the best in the world, for this, India needs to end dependence on imported weaponry, which is expensive and is not of the latest technology,” he said after laying the foundation stone for Hindustan Aeronautics Limited’s (HAL) new helicopter manufacturing unit in Karnataka’s Tumkur district. Recalling former Indian prime minister Lal Bahadur Shastri’s famous slogan of “Jai Jawan, Jai Kisan”, Modi noted that India achieved self-sufficiency in food grains in the last 50 years and called upon similar replication in indigenous weaponry. Coming up at 610 acres at Bidarehallikaval village, 125 km from Bengaluru, the new facility, which will entail investment of approximately Rs.4,000 crore, will manufacture up to 10 classes of helicopters including Light Combat Helicopter (LCH), Light Utility Helicopter (LUH) and Naval Multi-Role Helicopters (NMRH). “Manufacturing unit coming up in Tumkur would not be an ordinary one, but one which would make the whole world take notice,” he said, calling upon HAL to ensure that the first helicopter built in the new plant will take flight by 2018. Reiterating the vision of Indian constitution’s architect B.R. 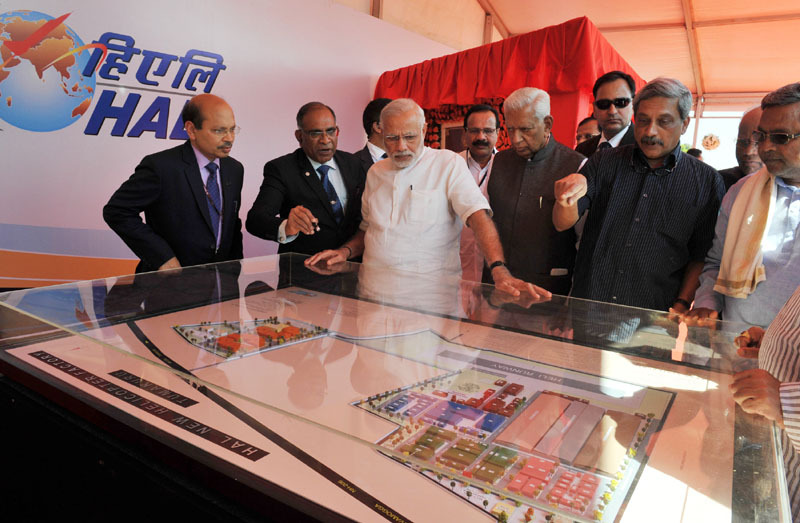 Ambedkar for industrialisation in India as a vehicle to empower to the poor and downtrodden, Modi said the new helicopter manufacturing unit is step in fulfilling that vision. “Nearly 4,000 families will directly or indirectly get livelihood due to this factory,” he said. Governor Vajubhai Vala, Chief Minister Siddaramaiah, Defence Minister Manohar Parrikar, union ministers D.V. Sadananda Gowda, Ananth Kumar and G.M. Siddeshwara (who hail from the state) were present at the ceremony.